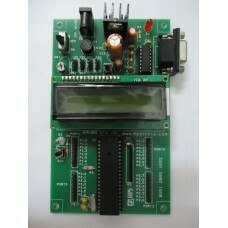 A microprocessor development board is a printed circuit board containing a microprocessor and the minimal support logic needed for an engineer to become acquainted with the microprocessor on the board and to learn to program it. 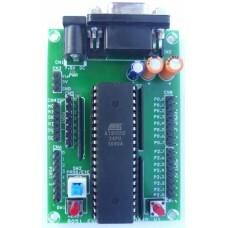 It also served users of the microprocessor as a method to prototype applications in products. 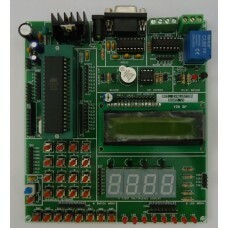 Unlike a general-purpose system such as a home computer, usually a development board contains little or no hardware dedicated to a user interface. It will have some provision to accept and run a user-supplied program, such as downloading a program through a serial port to flash memory, or some form of programmable memory in a socket in earlier systems. 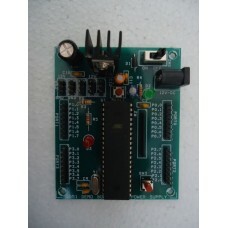 This Evaluation board provides an easy and low cost way to develop projects on 8051 MicroController.All the required software's are available as free download including a C compiler. 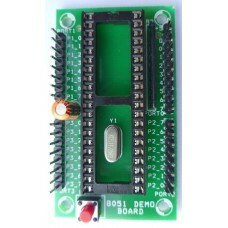 This Evaluation Board provides an easy and low cost way to develop projects on 8051 microcontroller.All required software’s are available as free download, including a C compiler. 2.64K Bytes of on-chip Flash program memory. 3.Port Extension for all Ports. 4.On Board  Regulated Power Supply. 5.12V, 5V and Ground source for external connection. 6.On Board Switch for ON/OFF.